This label is a new brand in the fashion world. Although the company was established in 2005 by Michael Teperson and Francesco Dori, the bag lines are receiving attention only now. The company was established in London, but they also have company headquarters in Florence - the inspiring Italian art city. This talented designer also is a graduate from the prestigious Parsons School of design and in the beginning he also tried his career in women clothing design. 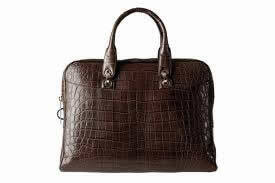 His men's bag line was started in 2007 and it was quite a success, so today these men's bags can be bought in most elite fashion stores globally. The color palette for these duffels and carryalls is quite light colored if compared to most men's briefcases and bags in dark brown or black. This designer loves to use light beige and light brown shades for the canvas and leather gym bags, travel bags and some very classic briefcases. Right now the brand's accessories department offer also carry on canvas bag, Frigo briefcase (picture on the left) in exotic crocodile leather, fly-on suitcase and several more great looking and practical men's carryalls. They have a sort of alternative look at the male fashion accessories and this is what distinguished them from such luxury giants as Prada or Gucci. This brand's collections are small and very neat in every way - if you want a beautiful briefcase, go for the Frigo model, you will not regret it. 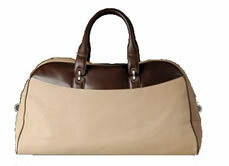 If you need a masculine carryall or weekender - have a look at the Tram duffle. The large and roomy bags are the shopper tote bags for men and also this brand has some spacious and practical handbags that can be quite handy.